Behold the face of a traitor to the Second Amendment. Republican Senator Mark Kirk of Illinois cast the 51st and only Republican vote that confirmed rabidly anti-gun Vivek Murthy to be the next U.S. Surgeon General. The Senate on Monday narrowly confirmed Vivek Murthy to be the nation’s surgeon general, making him one of the highest-profile beneficiaries of the Senate’s nuclear option. The nomination was strongly opposed by the National Rifle Association because of Murthy’s support of gun-control laws and by Republicans who doubted that a 37-year-old physician was qualified for the public health position. 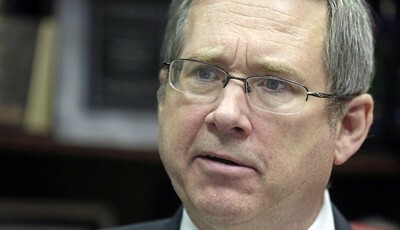 Democrats confirmed him, 51-43, with the support of a lone Republican: Mark Kirk of Illinois. Democrats Heidi Heitkamp of North Dakota, Joe Donnelly of Indiana and Joe Manchin of West Virginia opposed him; all hail from red states where the gun lobby is particularly powerful. Republicans have strongly opposed him not only because of his gun-control views but because of what they say are his lack of qualifications for the job and past political involvement. Murthy was the founder of Doctors for Obama, a group that backed the president’s 2008 campaign. Roll Call described Kirk’s vote as a betrayal of the NRA. Sen. Mark Kirk, R-Ill., defied the National Rifle Association to confirm Vivek Murthy as surgeon general. The Murthy confirmation was delayed for months due to opposition by the NRA and most Republicans, primarily over his support for gun control measures. But Kirk’s vote helped put him over the top with a 51 to 43 vote Monday. Kirk’s move comes as he seeks to moderate his voting record in the run-up to 2016 given that he will be a top target for Democrats in a blue state. His office didn’t immediately respond to questions about Kirk’s vote. Kirks’ vote in favor of Murthy was naked self-interest in hopes of being reelected in 2016 as a moderate. We don’t need this kind of “friend” of gun rights in Illinois… or anywhere else. The Illinois Republican Party needs to find a viable candidate to primary Kirk, and perhaps the Illinois State Rifle Association needs to take a key roll in helping drive that nomination. Murthy has very limited medical experience, and his only real “qualifications” for the position have been his rabid political advocacy for Obamacare and the President’s political campaigns, and his pathological hatred of firearms. Murthy hopes to argue that “gun violence” is a public health issue, which seems to be President Obama’s primary reason for nominating him for the position. The office of Surgeon General is mostly symbolic, but it is a platform that can help shape public debate by deciding which public health issues remain on the public’s radar.